I had a bit of a sleep in today and rolled my sandy eyes out of bed at 8am to wallow in my last day of China. I pottered around for a bit, drank some coffee and hauled myself out for one last lazy trot through the corn fields. It was a super hazy morning and I could barely see the hills which are not very far away. It’s such a nice little circuit running along these very neat little paths through the corn, into the bushland, around a few hills and back through the village. It’s such a relaxed environment out here compared to the density and volume of the cities in China, I can totally see why Shen chose to make Huairoa his base. I came back for some breakfast and spent the morning ordering supplies for new work and staring at my computer. Yenzu cooked up an amazing lunch, I was a bit worried that I was looking at frogs legs but it turns out they were duck wings that had been preserved. We ate duck and cucumber salad, a potato, chicken and peas dish and crazy preserved duck wings and necks. After lunch I packed my suitcase (mostly) and returned to my favourite couch to catch a few hours of being super lazy. 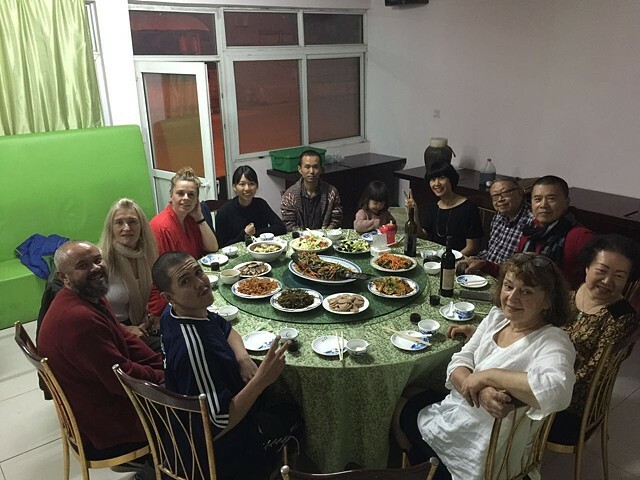 We took everyone to dinner at the same little restaurant opposite the farm where Eugenia is staying. This time we had a private room and they brought out endless dishes and we made endless toasts which meant endless yellow wine being sculled. Shen had some very heartfelt and much appreciated words about our brief time in China and we all got pretty sloshed. I played a lot of hide and seek with Ida and we all had a great time. Afterwards we headed back to Shens where he laid out another huge array of snacks and we got stuck into the wine. Chloe and Silja played the pian for us, they’re both excellent musicians and by 1230 it was time for me to hit the hay. I had to be up at 530am to drive out to the airport and I wasn’t looking forward to waking up half cut. As it turned out I woke up at 430am and couldn’t get back to sleep. China you’ve been an amazing spectacle, so much hospitality, warmth and incredible art. I loved every minute hanging out with the new little family of me, Justin and Eugenia. Thanks Shen and thanks 4A. Also, thanks Yenzu, Veronica, Hamida, Mikala, Gaodaqiang, Silja, Christina, Susan, Yen, Ida, Qino, Lisa, Joe and especially Joanna! Also, thank you Sun Shaokun.